This town has a commanding view of Trapani’s port as it is nestled on the mountain Eryx, of which several legends account for. From there it also commands a view of the valley and the sea. 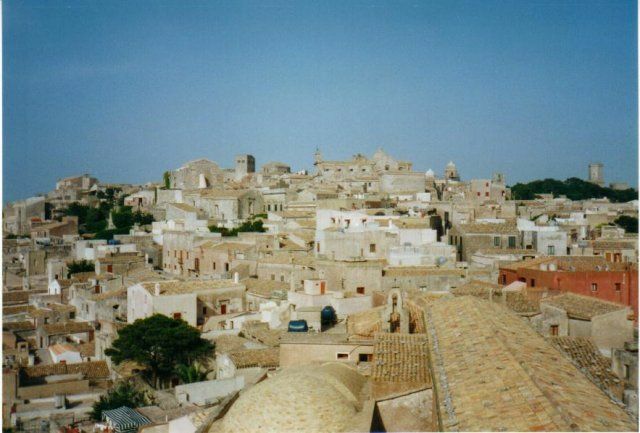 This town which dates back to the Middle Ages lies 750 above sea level. 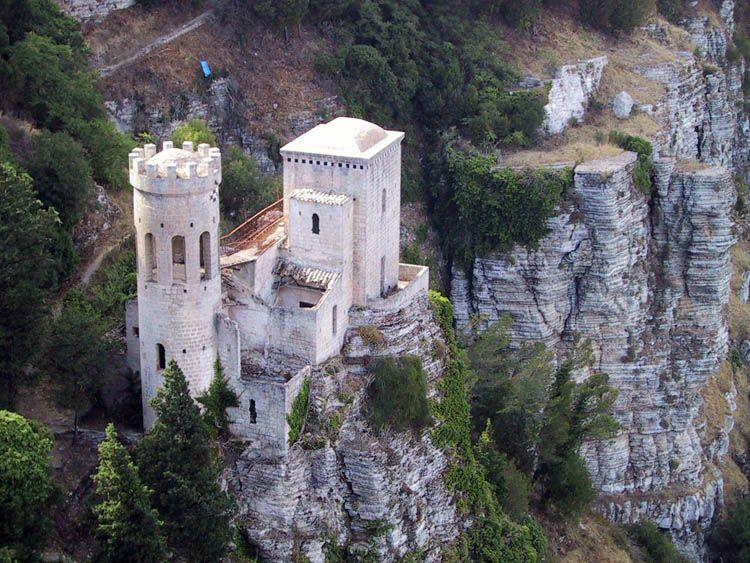 Churches and forts abound in Erice, which also characterizes for its changing weather which is hard to be forecast. The journey from Trapani to Erice by funicular is a wonderful experience not to be missed at all. In the Antiquity Erice was devoted to adoring Venus (Phoenicians ‘Astarte or Greeks’ Aphrodite). The town was her holy site. The Elymians traced their ancestry back to Aeneas, Venus’s Trojan son. The sacred prostitutes were hosted in the temple where the acolytes served also as prostitutes. Luckily this temple is still intact, in spite of the sack of the town. 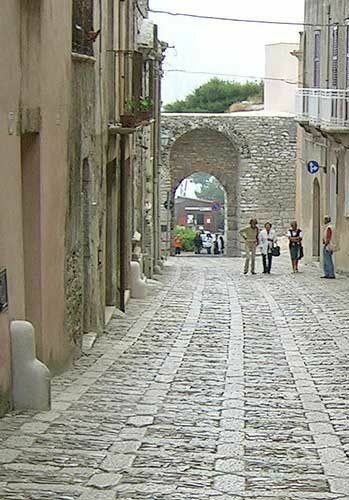 This triangular town has two main roads Corso Vittorio Emanuele and Via Generale Salerno. Eryce has changed since the time Virgil found a resemblance between Eryx and Mt Athos as to height and mysticism. Added to the temples, convents, narrow paths between buildings, niches to honour God, today shops stocking carpets and souvenirs have changed Erice’s appearance. The 12th-13th century Norman Castello di Venere (Picture 2) that Roger I crushed when he seized power sits on the upper part of a hill commanding views of San Vito lo Capo, Monte Cofano and Trapani. The 14th century Chiesa Madre boasts a campanile with mullioned windows. The church’s interiors underwent some modifications which involved including other styles. In 1865 changes were introduced in its interior in Neo Gothic style; however its 15th century-side chapels did not underdo any change. Museo Civico Antonio Cordini is on Corso Vittorio Emanuele. Among the pieces of its collection the most remarkable are a head of Venus dating back to the 4th century and Annunciation created by Antonio Gagini. Erice’s artisans have mastered the art of making the frazzate (rugs made from colourful shades of cotton rags). They make a perfect souvenir from this pretty town. Monte San Giuliano is off Corso Vittorio Emanuele. Its doorway is an arch coming into pieces that opens onto a patio embellished with heavily hanging hydrangeas Palatable pasta, fish and seafood are served under a green vined terrace. Exquisite dishes in excellent setting. La Pentolaccia is an elegant restaurant set in a converted 16th century monastery. It fills with tourists attracted by its good menu. It deserves a try. Antica Pasticceria del Convento sells mouth watering pastries and sweets. Grammatico Maria’s café is called after the most renowned pastry chef on this land, who also is in charge of it. Her pastries are just inspired by heaven. BY BUS: to/from Trapani (length: 45 minutes, services:10 a day, Mon-Sat, 4 a day on Sun). Arrivals and departures from Porta Trapani. BY FUNICULAR: from Trapani: (services 2 a day).